Director David Fincher had built up quite a career for himself in the commercial and music video realm through his association with Propaganda Films. 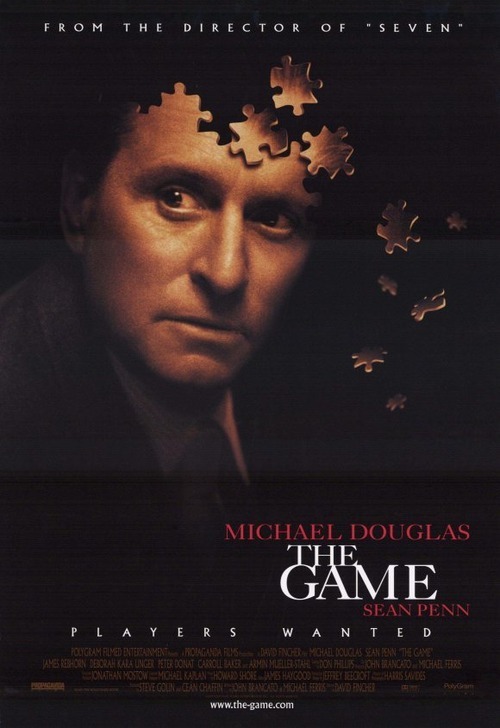 After the breakout success of his feature SE7EN (1995), Fincher was able to leverage this newfound clout into a collaboration with Propaganda for his third feature, a suspenseful puzzle thriller in the vein of Alfred Hitchcock called THE GAME (1997). THE GAME’s origins are interesting in and of itself, with Fincher actually being attached to direct the script by John Brancato and Michael Ferris as his return to features after his abysmal experience onALIEN 3 (1992). The sudden availability of SE7EN star Brad Pitt forced the production of that film to go first and delayedTHE GAME by several years. Ultimately, this proved to be a good thing, as SE7EN’s runaway success set THE GAME up for similar success with a built-in audience hungry for the visionary director’s next work. Nicholas Van Orton (Michael Douglas) is a wealthy investment banker who lives by himself in a huge mansion outside of San Francisco. His solitary existence keeps him at an emotional distance to those around him, a result of some deep emotional scarring that stemmed from his father’s suicide during childhood. On a particularly fateful birthday (having reached the age his father was when he killed himself), Nick’s brother Conrad (Sean Penn) shows up with an unusual present: the opportunity to participate in a live-action game, organized by an enigmatic entertainment company called Consumer Recreation Services. Nick ventures over to the CRS offices to indulge his curiosity, but after a rigorous mental and physical evaluation, he’s ultimately deemed unfit to take part in the game. So imagine his surprise when he arrives home that night to find a clown mannequin in his driveway (placed in the same position that his father was found after jumping off the mansion’s roof), and the nightly news anchor interrupts his television broadcast to address Nick personally and announce the beginning of his “Game”. Trying to ascertain just what exactly is going on, Nick follows a series of perplexing and macabre clues, eventually encountering a waitress named Christine (Deborah Kara Unger) who may or may not be a part of this Game. As his life is manipulated to increasingly dangerous degrees, Nick loses control of his orderly lifestyle and begins to question CRS’ true intentions for him—- is this really just a game, or is it an elaborate con designed to drain his considerable fortune and rub him out in the process? With THE GAME, Fincher has constructed an intricate puzzle for the audience to solve, wisely placing the narrative firmly within Nick’s perspective so that we’re taken along for his wild ride. Because the story is so dependent on shocking twists and turns, subsequent re-watchings can’t replicate the exhilarating experience of seeing it for the first time. However, Fincher does a great job of peppering clues throughout that are so subtle I didn’t even notice them until my fourth time around, such as Unger’s character being on the periphery of the first restaurant scene without so much as a close-up or wide shot of her face to announce her presence. Likewise, Nick’s first visit to CRS contains a strange interaction wherein the receptionist appears to give an order to the Vice President of Engineering (played by recently-diseased character actor James Rebhorn)—- why would a receptionist be telling a VP what to do? These are only two subtle clues in a story that’s absolutely stuffed with them, which makes for something new to find with each re-watching. Douglas turns in a fine performance as a cold, lizard-like Scrooge archetype. Nicolas Van Orton plays like a subdued, less flamboyant version of WALL STREET’s Gordon Gekko, which works because the distant, calculating aristocrat archetype is one that Douglas can pull off better than anyone. Fincher’s casting of Douglas also adds reinforcement to the idea of Fincher as Stanley Kubrick’s heir apparent (Douglas’ father, Kirk Douglas, was also a famous film star who headlined Kubrick’s PATHS OF GLORY (1957) and SPARTACUS (1960). As the cold, cynical waitress Christine, Deborah Kara Unger is a great foil to Douglas’ character, as well as an inspired female part that resists becoming a conventional “love interest” trope. Her ability to mask her feelings and intentions is crucial to the success of THE GAME, leaving Douglas and the audience constantly trying to figure out where her loyalties lay. Sean Penn’s role as younger brother Conrad is smaller than his usual performances, but he is no less memorable as a disheveled, mischievous agent of chaos. The late character actor James Rebhorn may have never held the spotlight in his own right, but every one of his performances was never anything less than solid, as can be seen in his performance as the disorganized, CRS VP of Engineering Jim Feingold. Rebhorn’s talents get a chance to truly shine in THE GAME, becoming the human face of the ominous CRS entity and, by extension, the film’s de facto antagonist. Fincher also throws in some small cameos in the form of fellow Propaganda director Spike Jonze as a medic towards the conclusion and SE7EN’s Mark Boone Junior as a private investigator tailing Nick. THE GAME is also Fincher’s first collaboration with the late, great cinematographer Harris Savides in the feature world (they had previously shot a number of commercials together). The anamorphic 35mm film frame is awash in steely blues and teals, accentuated by high contrast lighting that signifies Fincher’s signature touch. Flashback sequences filmed on 8mm provide a dreamlike nostalgia that appropriately dances along the line of sentimentality and melancholy. Savides is well-suited to translate Fincher’s vision to screen, ably creating a push-and-pull dichotomy between the sleek polish of Nick’s old money world and the slick CRS offices and the seedy grunge of the back alleyways and slums that Nick’s Game takes him to. The film is essentially about Nick’s loss of control, which juxtaposes his confused flailing against deliberate, observational compositions and precise dolly movements as a way to echo CRS’ forceful herding of Nick along a predetermined path. This visual precision is highly reminiscent of Kubrick’s work, and very well may be what it would have looked like if Kubrick had ever decided to make an Alfred Hitchchock thriller. Another nod to Kubrick can see in the video slideshow that Nick watches as part of his initial evaluation, which in and of itself highly resembles its infamous counterpart in A CLOCKWORK ORANGE (1971). SE7EN’s Howard Shore returns to create the score for THE GAME, crafting an intriguing, brassy sound to reflect the propulsive mystery and peppered with a tinge of melancholy piano that hints at Nick’s inability to move past his father’s death. Fincher’s stellar ear for needle drops also results in the incorporation of the White Rabbits’ iconic “Somebody To Love” as a psychedelic taunting mechanism in the scene where Nick arrives at his mansion to find it’s been vandalized with black light graffiti. All of these elements are tied together by Ren Klyce’s sound design into an evocative sonic landscape that draws us further into the puzzle. Fincher’s music video work often explored the boundaries of the film frame, transgressing arbitrary lines to see what was being hidden from view. Most of the time, this meant that the artifice of the production process (crew, set facades, equipment, etc.) was made known to the viewer. THE GAME is an appropriate avenue to explore this idea in feature form because the story concerns itself with what happens when Nick is essentially placed inside of his own movie. This plays out in the form of any close inspection of a given object or development by Nick reveals its inherent fakery and connection to filmmaking. Christine’s apartment is revealed as a fake set via various set dressing techniques Nick stumbles upon. The hail of gunfire directed at Nick and Christine by masked gunmen is comprised of harmless blanks. Nick’s iconic plunge from the top of a San Francisco skyscraper is cushioned by a giant stunt airbag. The game Nick has been thrust into is an elaborate, deliberate manipulation of actors and events designed to take him on a film-like character arc and transformation. To this effect, architecture (another of Fincher’s thematic fascinations) plays a huge role in the proceedings. Fincher’s locations and sets are always architecturally impressive, and THE GAME doesn’t disappoint in the classical style seen in Nick’s mansion and San Francisco’s financial district, as well as the sleek modernity of CRS’ futuristic offices. Fincher often frames his subjects from a low angle in order to show the ceilings—this accomplishes the dual effect of establishing the realism of the space as well as conveying a subtle sense of claustrophobia (a sensation very important to THE GAME’s tension). Production designer Jeffrey Beecroft makes great use of lines as a way to direct your eye (especially in the CRS headquarters set). These lines subtly point Nick (and by extension, us) in the right direction to go despite the orchestrated chaos around him. Fincher is able to find several instances within the story to indulge in other fascinations. THE GAME uses technology to striking ends in advancing the plot, like the television magically talking to Nick in his own home, or the hidden video camera lodged inside the clown mannequin’s eye. A distinct punk aesthetic runs through Fincher’s filmography, with the most literal examples being found in FIGHT CLUB (1999) and THE GIRL WITH THE DRAGON TATTOO (2011), but even in a cold-Scrooge-turned-good tale such as THE GAME, Fincher is able to incorporate elements of punk culture in a natural way (the aforementioned mansion break-in and black light graffiti vandalism sequence). And finally, Fincher’s approach to the story is informed by a nihilistic sensibility, in that Nick is inherently a cynical, selfish person, along with the prominent theme of suicide and the ultimate revelation of the film’s events as orchestrated manipulations and inherently false. THE GAME was a modest hit upon its release, bolstered by a compelling story and strong performances that were, in this author’s opinion, much better than those seen in SE7EN. By achieving a balance between engrossing performances and superb technical mastery, Fincher shows off huge growth as a director with THE GAME. Ultimately, the film itself was somewhat lost in the sea of late 90’s releases, and for the longest time it languished on a bare-bones catalog DVD with a neglected transfer. Thankfully, THE GAME has undergone something of a cultural reappraisal with the release of The Criterion Collection’s outstanding Blu Ray transfer. Now, THE GAME is often referenced among film circles in the same breath as his best work, and is fondly remembered as one of the best films of the 1990’s (alongside SE7EN and FIGHT CLUB). For Fincher, THE GAME cemented his reputation as a great director with hard edge and reliable commercial appeal. THE GAME is currently available on high definition Blu Ray via The Criterion Collection.